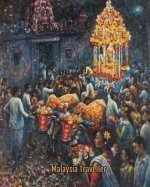 I stayed in The Majestic Malacca over twenty years ago. At that time it was a small hotel in a 1920's former mansion which was looking very run down. The hotel had bags of character but frankly was a bit of a dump. If you want to see some pictures of how the hotel used to look you can take a look at my blog article. Since then the hotel has been acquired by the YTL Group who have given it a total makeover and added a modern extension. The new owners have done an excellent job in restoring the original mansion house to its former grandeur. The original building now contains the hotel's lobby, bar and reception rooms while the guest accommodation (only 54 rooms and suites) is in the modern tower block behind. 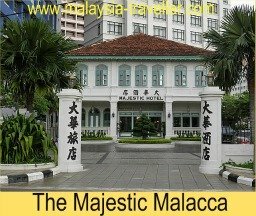 I recently had some friends staying at The Majestic Malacca and was able to take a sneak peak around. The lobby still has the original decorative floor tiles but the bar and reception have definitely been upgraded. My friends and I were served delicious lychee flavoured Chinese tea presented in a beautifully lined bamboo basket which acts as a tea cosy and cup holder. It is small details like this which help explain the hotel's consistent #1 ranking among hotels in Melaka. The immaculately attired staff in the lobby were welcoming and friendly and the place had a relaxing atmosphere. My friends told me that their room was excellent - spacious and tastefully furnished. Their only disappointment was the service at breakfast which was not up to their expectations but these things can happen even in the best of hotels especially in Malaysia where there is strong demand for employees in the service sector. I thought the location of the pool was a bit odd, wedged between the old building and the new tower. It looked inviting though. There is a smart glass fronted gym next to the pool. OK if you have a great body and don't mind being looked at. 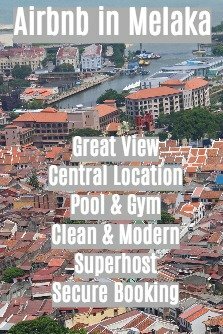 The location of the hotel is not quite as good as the others on my list of hotels in Melaka, being a bit further from the main tourist spots . (You can find a map here.) It would take you 20 -30 minutes on foot to reach Dutch Square for example but it is an interesting walk (see my Melaka Heritage Trail if you want to see the route). 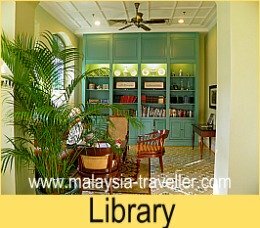 The hotel faces the Melaka River and you can take a walk on the river bank. Immediately across the river is the traditional Malay village called Kampung Morten which is worth visiting - take a look inside Villa Sentosa to see how the Malays live. If you arrive by car, there is a large car park with free parking for guests. I would thoroughly recommend this hotel if you have the budget to spare. 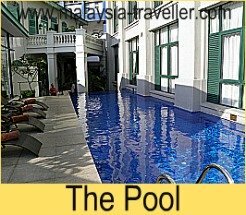 Want to Book the Majestic Malacca? You can take a look at Agoda's website here to check room availability, best room rates or make a booking.